ORLANDO, Florida – An injured manatee that was rescued by SeaWorld Orlando on June 8 was determined to be pregnant during a recent ultrasound procedure by the park’s animal care team. 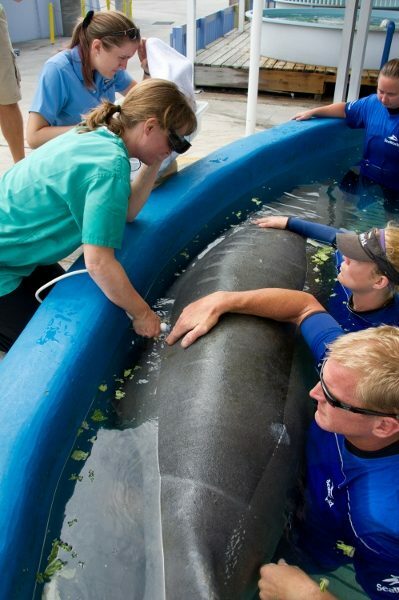 The manatee has been receiving extensive care at SeaWorld Orlando for injuries sustained from entanglement. 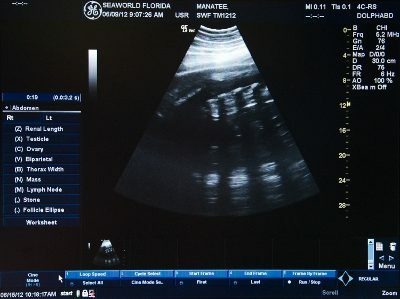 Due to her large size, the veterinary team performed an ultrasound and discovered that she is pregnant. It is unknown exactly how far along in her pregnancy she is. The gestation period for a manatee is approximately 12 months. On June 8, SeaWorld's animal rescue team rescued the 10-foot manatee from Sykes Creek in Merritt Island, Fla. The manatee had severe injuries to its right flipper caused by a tightly wrapped crab trap line. Fishing line was also wrapped around both of its flippers. Weighing nearly 1,400 pounds, the adult female was transported by the animal rescue team to SeaWorld Orlando for further evaluation and care. After assessment, its right flipper was amputated and bandaged. She is in overall good condition and her health continues to improve. SeaWorld's animal rescue team is on call 24/7 to save and care for injured, orphaned or ill animals. So far in 2012, SeaWorld Orlando has rescued 13 manatees. All manatee rescue footage produced by SeaWorld under FWS Permit Number MA7701911.